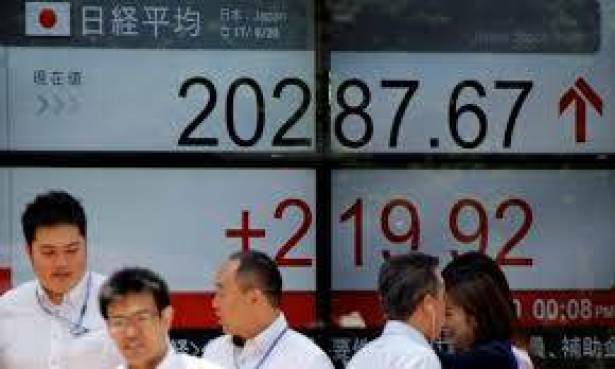 Asian stocks and the dollar edged up on Thursday, shaking off the risk aversion that gripped financial markets overnight after President Donald Trump threatened to shut down the U.S. government and end the North American Free Trade Agreement. MSCI's broadest index of Asia-Pacific shares outside Japan .MIAPJ0000PUS rose 0.4 percent. Japan's Nikkei .N225 pulled back 0.1 percent, with steelmakers slumping after the Nikkei business daily reported that Toyota Motor Corp (7203.T) was looking to cut the price of steel supplied to component makers in the October-March period. That is the result of lower rates, already agreed for the six months through September with steelmakers such as Nippon Steel & Sumitomo Metal Corp. Four of the five biggest decliners on the index were steelmakers. Chinese stocks .CSI300 .SSEC were down about 0.3 percent, and Hong Kong's Hang Seng .HSI jumped 0.45 percent. South Korea's KOSPI .KS11 added 0.4 percent and Australian stocks gained 0.25 percent. Overnight, U.S. stock indexes closed between 0.3 percent .IXIC .SPX and 0.4 percent .DJI lower. Trump said at a Tuesday night rally in Arizona that he would be willing to risk a government shutdown to secure funding for a wall along the U.S.-Mexico border. Those comments came ahead of a late-September deadline to raise the U.S. debt ceiling or risk defaulting on debt payments. Fitch Ratings said on Wednesday that a failure to raise the federal debt ceiling in a timely manner would prompt it to review the U.S.'s sovereign rating "with potentially negative implications." "Asian stocks largely weathered the unexpected shutdown comments... feeling removed from concerns of a government shutdown in the U.S.," Jingyi Pan, market strategist at IG in Singapore, wrote in a note. "That being said, any pressure within U.S. bourses could still trickle to regional markets and would be one to track in the near term," she said. The dollar added about 0.2 percent to 109.195 yen JPY=D4, having lost 0.5 percent overnight, after managing to contain losses on Wednesday in Asia following Trump's comments. The dollar index .DXY, which tracks the greenback against a basket of six major peers, gained 0.15 percent to 93.277 on Thursday, following the previous day's 0.4 percent slide. Trump "is using one of his tricks to get what he wants and does not seem to care what could be the consequence for the U.S. shutdown on the economy," said Naeem Aslam, chief market analyst at Think Markets. "What matters the most for Mr. Trump is to build the wall, which he promised throughout his campaign." Also undermining the dollar were Trump's threats to end the North American Free Trade Agreement, after three-day first-round talks that ended on Sunday failed to bridge differences. Further rounds of talks will take place in September and later this year. Both the Canadian dollar CAD=D4 and Mexican peso MXN= were little changed at C$1.254 and 17.679 to the dollar respectively. The euro EUR=EBS was slightly weaker at $1.18005, after climbing 0.4 percent on Wednesday on strong German and French manufacturing and services sector surveys. Bitcoin BTC=BTSP inched up 1.3 percent to $4,160, but remained off its all-time high of $4,480 hit a week ago. It is up 333 percent this year. Investors are also keeping a close eye on a central banking conference in Jackson Hole, Wyoming, which begins on Thursday, where Federal Reserve Chair Janet Yellen and European Central Bank President Mario Draghi are both due to speak, although new policy messages are seen as unlikely. "We are inclined to think that the Jackson Hole symposium will probably disappoint, with central bankers preferring to explain detailed actions in September," Societe Generale analysts wrote in a note. In commodities, oil prices crept lower as rising U.S. oil output dampened some of the optimism that had accompanied eight straight weeks of declines in U.S. crude inventories. U.S. crude CLc1 slipped 0.1 percent to $48.36 a barrel, after rising 2.2 percent over the previous two sessions. Global benchmark Brent LCOc1 was marginally lower at $52.54, after climbing 1.8 percent in the past two days. Gold XAU= was also steady at $1,289.69 an ounce, retaining Wednesday's 0.4 percent jump.